Shahrukh Khan’s effort to rope in the International pop sensation Akon in Ra.One, was a successful one. 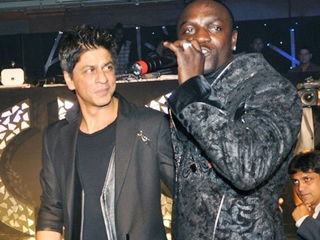 Reports say that SRK is possibly all set to bring Akon on the cricket fields of the next IPL season. He further revealed that the song was coined by him and the Kahaani director Sujoy Ghosh, five years back. Vishal confirms that “the tune of the chorus will be the same. The rest will change.” Well Shahrukh and Vishal, we wish the new version works for KKR in the upcoming season as well.